This tool allows you to migrate lists or files from your SharePoint on-premises document libraries or from your on-premises file shares and easily move them to either SharePoint or OneDrive in Office 365. It is available to Office 365 users. In the latest version, Microsoft has introduced PowerShell cmdlets to perform migration that has all features of the SharePoint Migration Tool (SPMT). Click here to download the SPMT latest version 2.1.100.0 (currently in open beta). The PowerShell .dll’s will be copied to %userprofile%\Documents\WindowsPowerShell\Modules location. Copy the below script and paste it in a Notepad. Save the file as SPMTMigration.ps1. Enter the SharePoint Online site credentials in the pop-up and enter OK. After a few minutes, the files from folder share will be migrated to SharePoint Online site. Thus, in this blog, you saw how to migrate files from Folder Share to SharePoint Online using PowerShell based on the SharePoint Migration Tool (SPMT) migration engine. SharePoint 2013 Hosting – HostForLIFE.eu : Is Server Side Code Dying Out In SharePoint? SharePoint Online is a Software as a Service (SaaS) offering from Microsoft which is part of Office 365 suite. In the SaaS model, we only consume the service provided by the service provider that we need to run our business. These services or applications run on the provider’s cloud infrastructure. We can consume these services on various devices including browsers and mobile devices. As we only consume the services, we do not have any control or permissions on the infrastructure. This means a lot in SharePoint development. As we cannot deploy our solutions or assemblies to the server, the only possible way of development is remote development. SharePoint has provided numerous client-side APIs, REST APIs to connect to the SharePoint site remotely and perform the work. End of Server Side Development? There are two major scenarios to consider while developing the solutions for SharePoint irrespective of whether it is OnPremise or Online version. While developing the solutions for SharePoint OnPremise, we can use the full trusted farm solutions by making use of most server-side APIs. There is nothing absolutely wrong in it. But, what are the CONS of this approach? The server-side code is version dependent. That means the same code might not work for the next version of SharePoint or the APIs used might get deprecated. The server-side code needs to be tested every time after the cumulative updates to the server. How to migrate this code when the business decision demands SharePoint version upgrade or moving to cloud (SharePoint Online)? The future directions from Microsoft are to develop solutions using remote APIs. The major advantage of this is the code will work independently of the SharePoint platform being used. It may be any version of OnPremie or SharePoint online. The same code will work effectively irrespective of the SharePoint version it is running on. The future OnPremise version of SharePoint i.e. SharePoint 2019 has more focus on client-side development. To have the solutions developed in future ready manner, here are few approaches being commonly used by SharePoint developers. CSOM offers remote APIs to connect to SharePoint environment and perform the operations. It is generally used to perform CRUD operations with SharePoint. Content Editor (CEWP) and Script Editor WebParts are more close the SharePoint developers. These WebParts are used very commonly to perform an operation on a single page. These can be effectively used to add HTML content on SharePoint page, as well as running scripts for any DOM (Document Object Model) manipulation on SharePoint page. Although heavy usage of these webparts brings in the governance issues, these webparts are most popular in SharePoint developer community. The PowerShell scripting tool also offers APIs to connect to local as well as remote SharePoint and perform the complex tasks. Initially, PowerShell was of only SharePoint Administrator’s favorite tool. However, over the time it catched the attention of developers too. REST APIs offers to perform basic CRUD operations against SharePoint objects such as lists, libraries, and sites. REST APIs can be combined with any of the above-mentioned approaches to achieve the certain functionality in SharePoint. SharePoint out of the box supports a vast range of REST APIs for developer needs. SPD is being used since ages now. The SharePoint Designer tool allows to connect to SharePoint environment remotely and customize it. SharePoint Designer is the obvious choice for developers to customize SharePoint forms, develop workflows, copy or move the documents. Microsoft did not release the SharePoint Designer version after 2013, but the same can be effectively used against SharePoint 2016 and Online version. Microsoft Graph provides unified APIs to securely connect to Office 365 applications including SharePoint Online and fetch the information. Graph APIs are not yet available on the OnPremise version of SharePoint. SharePoint development can be effectively combined with additional supporting infrastructure like MS Flow, Power Apps, Power BI, MS Azure, etc. 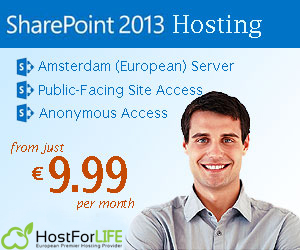 SharePoint 2013 Hosting – HostForLIFE.eu : How To Read SharePoint TermStore (Managed Metadata) Using REST API? SharePoint itself provides a REST API for each site you create. It is such wonderful thing to help the developers manipulate maximum areas of SharePoint like accessing lists, settings, users, user groups, navigation, etc. through the application that you built. Since there are some restrictions and threshold limits are always there in SharePoint to improve performance we cannot access some areas of SharePoint through Rest API. But still it is possible to access it by using SharePoint’s old web service methodology (until Microsoft deprecated it). Let’s see the workaround to use SharePoint’s old web service methodology to get the TermStore Data with step by step instructions. Create a Managed Metadata field in any List and map the respective term set item with it, like below. Now, using REST API get the field information of the Managed Metadata column which you have created in the previous step so we could be able to get the SspId and TermSetId in the field XML of the list. Note – Since we need only these two values, I have queried only those fields in ODATA query $select=SspId,TermSetId in above url, if you want to read all field information, you can use ,*. Now, by passing these SspId and TermSetId, we need to make a SOAP call to invoke SharePoint web service to get the Term Set Data. Here, we are going to post the input data in XML format so please mention the content-type in the headers as “text/xml” along with the authorization headers. The post body will look like below. Replace the highlighted values with respective ids. Finally, we will get the expected output in XML format and parse the XML to deserialize API response, sample output format is mentioned below.